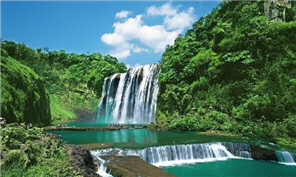 The Women Leaders in Ecology & Development Forum will be held on July 6 at the International Ecology Convention Center in Guiyang. Guiyang government officials met with a delegation from Singapore on June 30, hoping to strengthen cooperation in economy, trade, science and technology, tourism, education and big data. An exhibition for China's fine art opened on June 28 at the Guizhou Art Museum with the theme "Discover Guizhou culture through paint collection". Mount Fanjingshan, a natural habitat for a number of rare plants and animal species in Guizhou province, has joined 12 other locations in China on UNESCO's World Heritage list. Southwest China's Guizhou province will invest more than 500 billion yuan ($75.6 billion) in constructing expressways in the next five years. Workers have successfully completed the closure of the top-bear concrete-filled steel tube arch bridge with the world's longest span of its kind in Southwest China's Guizhou province when they installed the last steel tube on Saturday. 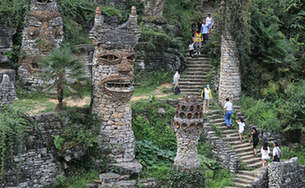 Song Peilun introduces the inspiration of his stone castle "Yelang" in Leping village of Huaxi district in Guiyang, Southwest China's Guizhou province, July 1, 2018.